Have you ever had to make a choice? A bunch of times, we guess. It ruins all the fun, being responsible for your own business and income especially. Besides, this process is quite complicated, crucial and even the littles miscalculation results in collapse. But slow down and don’t give up, Cart2Cart was called upon to give you a hand. 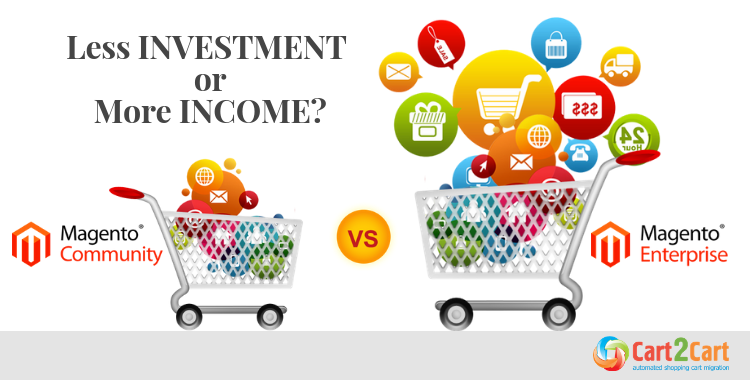 Let’s complete one of the biggest challenges that eStore’s owners bump into when deciding which platform to choose to go with. In this article, we’re going to cover the differences, advantages, and disadvantages of Magento Community vs Enterprise Editions usage. What are you really paying for when going with EE? Is its enhanced functionality essential for your business? How are you supposed to get by on the OE options? Is that even possible? And are EE’s premium service really worth whatever it costs? Stay tuned, it’s time for a showdown. In the skiing metaphor, better once to see, than a hundred times to hear. Cart2Cart - your fine fellow and good counselor - have set up infographics for you not to pass without reply any question. No one can decide between these two carts which of them fits you better and meets your demands to the limit. Nobody but you. First of all, you should assess how daring goals and ambitious expansion plans you have, what you hope to gain from all of this? If you hold in mind a great deal, be ready to invest today and reap the benefits in the future. Well, that’s - not rush to judgment. We’d instead analyze each pro and con step-by-step to delve in and get to the point of truth. Let’s get started. Customizable & mobile-friendly admin dashboard. It’s supposed to be a right choice for someone who maintains a small to medium business, developers, tech-savvy merchants and for ones, who would like to experiment in building an eShop. Insurance or margin for error, whatever you name it, but the fact is, with CE you lose nothing because the only charge you have to pay for comes from the domain name, web hosting and a qualified Magento programmer (if necessary). To be honest, hardly anyone wants to spend $15,550 if there’s a free alternative. But this price doesn’t appear out of thin air, so you have to bear in mind that EE includes a considerable number of aspects that worth money when CE is deprived of them. Magento Commerce is an exclusive premium paid version, mostly preferred by medium to large and large to enterprise business. Does the EE’s price tag indeed come with added value, a heavy load of enterprise-level features and high-end functionalities? Without questions! How much is Magento Enterprise? 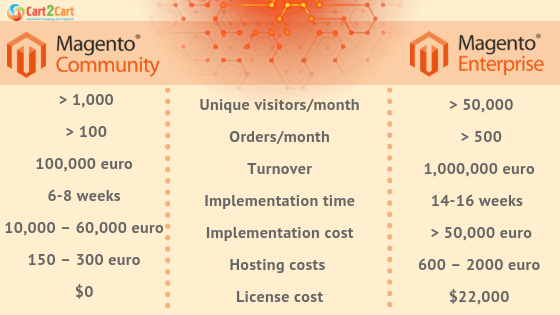 At last check, Magento 2 premium version’s price ranges from $22,000 to $125,000 per year. That may seem a little steep compared to its open-source counterpart, which is $0. But like most things in life, you do get what you pay for. CE’ themes and templates cannot be integrated into EE due to different code bases. Seems to be too high a cost and sounds frightening? Don’t jump to conclusion. Magento Enterprise is explicitly made for sites with large volumes of traffic and sales. It also provides you with the chance to host separate parts of your website on different servers. EE’s arsenal of high-end functionality comprises customer segmentation with targeted offerings, minimum advertised price, return management authorization, price and promotion permission, an enhanced catalog and content management system, among a multitude of features. Let’s look deeper, there are still many fascinating things ahead! First of all, applying either the Community or Enterprise edition, you will get the advantage of Magento Connect – the Magento Extension marketplace, where there’s the whole variety of apps is in public access. Both of them are open-source, which means the same core features and essential functions released. These versions belong to the same Magento ecosystem. Last but not least, integration with different databases available, due to the webservers API, feel free to use. As you can see, Magento Enterprise platform picked up only milestones of its competitor, but even these basic features are significant when choosing the sales panel to go for. The premium edition adds more values to online merchants and their customers, making a difference between Magento Community and Enterprise. Not to mouth empty words, look through the mean values for both versions. Magento Open Source is definitely out of EE’s league, particularly when it comes about meeting your eStore complex demands and selling capabilities. Feeling lonely with all these tech concerns? Not anymore. Magento 2 Enterprise Edition guarantees 24/7 technical support, which means certified developers and experts will resolve all technical problems that may occur with your eStore. With this great resource which will guide your business in getting the most of the Magento, you'll definitely achieve your daring aims. CE has no support at all. Above all, with EE you’re “armed” with dedicated account manager form Magento team to help you whenever you ask for assistance. The merchants also can be sure about their security support. The group of specialist scan the platform often with and enhance Magento core security with special diagnostic tools. It’s used for a more in-depth analysis of your website’s different aspects such as crucial database tables, installed extensions, and modified core files. Such supervision provides the best environment to work in. One more significant difference between CE and EE. Magento Enterprise features, we’re going to describe, benefit your customers and your company as well. The premium edition of Magento uses upgraded content staging, targeted content, sophisticated attribute based customer segmentation, abandoned cart reminder emails and many more elements for business marketing, merchandising, and searching. Content Staging and Preview enables merchants to complete some challenges without hiring Magento developers. Elastic Search is beneficial to locate the product clients are searching quickly. In Magento EE it is easy for store owners to view, edit, create multiple invoices and many other options to independently process order from the very beginning until it’s completed. Straight from the Admin panel you can update products, prices, and coupons in customers’ shopping carts and wish lists, can create customizable emails for account updates, password resets, send email notifications and RSS feeds with order status at ease. Take advantage of the filters (like color, price, type, size) to sort your products and narrow down results as you wish. Remember, there’s only one choice: give a client what he wants or see an image of him going away. When it comes to the difference between Magento Community and Enterprise, it’s much more effortless to let customers do a fantastic shopping, they have never experienced before. If you're looking for the solution to grow shortly and gain heavy website traffic, then site functionality, significant customizations, security, and product enhancements will be essential to bottom line eCommerce goals. Magento Enterprise edition is designed for scalability if you're supposing high website traffic since its underhand code base is better drafted to implement high-end development. Enterprise edition features an accelerated rendering of admin product, and also customer and order management views for faster access to information. Is this how you want to play? Migrate from Magento Community to Enterprise and get advantages of accurate, swift and secure migration in no time. Remember: changes are leading new achievements! Now you’re facing challenges Magento Community vs Enterprise, try to answer a straightforward question: what are you’re working to accomplish? It’s not about which platform choose to run the business, it’s about how lucrative business you expect to hold in the result. Make no mistake, believing that you don’t have many products, so CE will work for you. Most of them are designed as configurable ones and have many attributes? Your approved customers need to be able to create wish lists, gift registries, buy gift cards and take advantage of non-standard payment forms (cash in hand, check & purchase orders)? Detailed reporting and advanced inventory management are inherent in your workflow? Cheers, you should perform Magento upgrade from Community to Enterprise right now! And Cart2Cart is the one, that can be of great help in it. Start Free Demo to leave an unprofitable, small and boring business behind and be trendy. With our service, your brand new store will deliver to buyers the most enjoyable experience ever. Good luck and be ready to resounding success.